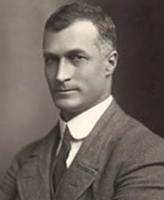 Hugh McCrae was an Australian writer of poetry, plays, prose and material for a light operetta. He also produced a number of memoirs, most notably one that featured the exploits of his poet father George Gordon McCrae, and those of his father’s friends. Additionally he compiled extracts from the journals and diaries of his grandmother and had them published. He also had artistic talents and could have become a famous cartoonist. Much to his everlasting regret he turned down the chance to produce illustrations for a filmed version of Felix the Cat when he was living in New York with Felix’s creator. playing the lead role of a poet of the same name. This happened during a brief spell living in the United States. Although McCrae concentrated mostly on prose and poetry he did write one play which was put on at Sydney’s Independent Theatre in 1933. This was a fantasy piece called The Ship of Heaven. As a poet he wrote with a light and delicate touch and was, perhaps, influenced by many other Australian literary figures that he was acquainted with. Friends included Shaw Neilson, Norman Lindsay and Kenneth Slessor. When he went to New York City in 1914 he shared an apartment with the film producer and cartoonist Pat Sullivan and it was here that he had the opportunity to become involved with the Felix the Cat project. While Sullivan would provide the inspiration for the story and characters, McCrae would be tasked with the illustrations. He refused to do so and, had he accepted that offer, his life might have been quite different. Hugh McCrae died in Sydney on the 17th February 1958. He was 81 years old.